Yeah, but: It's free p0rn - who says no to that? 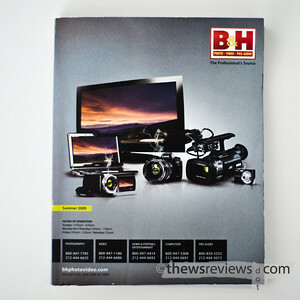 The Long Version: B&H Photo puts out its catalog twice a year, and it's 450+ pages of optics, electronics, and other goodies. It spans a huge range of products, from home theater A/V gear to lame iPod knock-offs called the "Zune". While I certainly like looking through the camera gear, it's actually the pro audio and video section that I really enjoy. Some of that stuff is so expensive that it makes my still cameras and lenses seem quite reasonable. The catalog has other bright spots, as well. Its cover earned a place on the Photoshop Disasters website, but there are also some gems inside. The description of the Nikon F100 boasts about its "balanced bill-blash," and the photo for the Olympus FE-3010 looks suspiciously like the Nikon P90. But it hardly matters; the FE3010 has already dropped by about $25 from its listed price, and it's on the cusp of being discontinued and out of stock. I can certainly appreciate the difficulty and futility of writing and proofing the blather for the hundreds of interchangeable products that won't last longer than it will take the paper to biodegrade - but it's still funny. The printed catalog is the exact opposite of a website. It's hard to find specific things, it's outdated almost immediately, and it costs a lot to distribute. But it's also easy to flip through. A website provides a specific answer if you already know the question; a catalog might be archaic, but it's the best way to find randomly interesting things. I wouldn't pay to buy one, but it's entertaining, educational, and I usually wear out the old copy by the time the next one arrives.